Arbor Day is traditionally the last Friday in April every year. Since 1872, Arbor Day has been celebrated by planting a tree. In Nebraska, Arbor Day is a civic holiday, and on the first Arbor Day in 1872, an estimated one million trees were planted. As each year passes, the Arbor Day holiday becomes even more important as the number of trees being cut down and destroyed in forest fires increase. How Do We Impact the Number of Trees in the Environment? Imagine our planet without the many beautiful, massive forests in our environment. It would be a desolate, empty, and disheartening place to live. Our planet relies on these great plants--we need trees to clean the air we pollute. Thousands of different species of insects and animals rely on tropical rain forests, deciduous forests, and coniferous forests to survive and create a safe habitat. If we continue to destroy forests without replanting, thousands of species of animals, plants, and insects could become endangered, as well as our food supply. Seventy percent of the world's critters live in a forest environment, and many would not be able to survive if their habitat were destroyed by deforestation. It's estimated by the National Geographic that the world's rain forests could completely vanish at the rate deforestation is occurring today. Each year, a countless number of trees are cut down from logging operations to provide the world's paper products, lumber, and other need's from families and businesses. Agriculture is also a major contributor to the loss of thousands of acres of trees. Farmers cut down trees to provide more land to grow crops or for grazing livestock. However, not all deforestation is intentional. Wildfires are also a huge contributor to the loss of thousands of acres of wildlife. Dry, hot areas of the Earth are most prone to wildfires, although they can occur anywhere. This is why it is vital to put out a fire that has been started. Wildfires are extensive, can spread at remarkable speeds from the original source, and they can jump gaps such as roads and rivers. This year, because of the severe drought in California and other western states, it is estimated that the wildfire season is likely to set a record. As individuals, we can't immediately control the amount of trees that are cut down from logging companies, or make wildfires completely stop. That will still happen, most likely for a long time before it stops or slows down significantly. As individuals, we can make a difference though. Every time we choose to buy paper products, throw away recyclable paper products, or fill our printer paper with non recycled white paper, we are silently voting to keep cutting down trees. By cutting down on the amount of paper products we use, and by using recycled paper products, we make an impact...just by making that small adjustment. Recycling paper products is extremely valuable and important. That's less biodegradable content that gets trapped in a landfill! If we recycled all the paper that we use, there would hardly be a need to continue to cut trees! There's a rule that everyone should live by: for every tree that is cut down, two more should be planted. If this idea was practiced by everyone who has ever cut down a tree, our planet would have the cleanest, purest air we have ever breathed. Arbor Day celebrates the importance of trees on our Earth, and encourages us to get involved in planting new trees. In the West Michigan area, there are many different tree nurseries to buy tree seedlings from, as well as more mature trees. 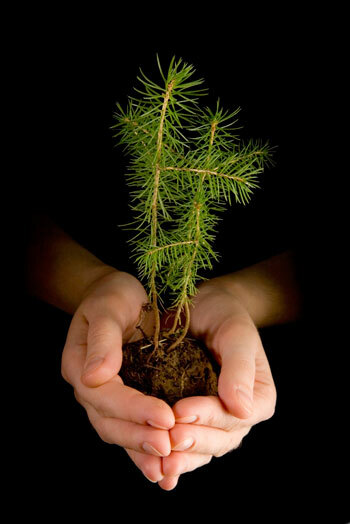 Take initiative and help the only planet we have by recycling paper products, and planting a tree this Arbor Day! An act so simple and small can be the start of something great. Planting trees can also save you money! In the winter, trees can reduce heating costs by blocking wind gusts, and in the summer, they provide shade, reducing A/C costs, along with creating more comfortable temperatures in your yard. Trees are a benefit all around. Read our story about the Conservation District Annual Tree Seedling Sale to order tree seedlings for Arbor Day. The deadline has passed, although you can still call the Conservation District for tree seedling availability at (231) 757-3708, ext. 3. 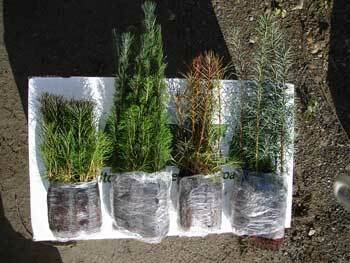 If you have a large property and would like to plant 25 trees or more, Needlefast Evergreens, located on Hansen Road in Ludington, has a large variety of coniferous and deciduous trees available at their farm. For more information, you can call them at (231) 843-8524. The average American uses 465 trees to create a lifetime of paper. If Americans recycled every phone book each year, an estimated 650,000 tons of paper could be saved. Every day, Americans buy about 62 million newspapers and throw out around 44 million of them, which collects at a landfill. Recycling one stack of newspapers about 6 feet tall saves the life of one tree 35 feet tall. Recycling approximately 1 ton of newspaper saves 17 trees. Paper and cardboard combined make up 73% of the materials in the landfill. Making one ton of virgin paper (non recycled paper) requires 3,688 lbs. of wood, 24,000 gallons of water, 216 lbs. of lime, 360 lbs. of salt cake and 76 lbs. of soda ash. We then have to treat and dispose of 84 lbs. of air pollutants, 36 lbs. of water pollutants and 176 lbs. of solid waste. To learn more about deforestation and ways it impacts the Earth, visit the National Geographic article on Deforestation. For more information about the different kinds of forests and the animals that rely on them, visit the Defenders of Wildlife website.